❀ Valid for SoTango Beginners courses (Level 1) starting in September 2017 - Bondi or North Sydney. ❀ Lesson videos and study notes included with course. ❀ Attend with or without a partner. Available only for people who attended our free 'Intro to Tango' Workshop on September 4 in North Sydney or September 6 in Bondi. To secure this offer - Full payment ($120) or 50% deposit ($60) must be paid in cash at the end of the class or by bank transfer before the end of September 6. The balance can be paid at the first class in cash (or by bank transfer prior to the first class). Click here for bank details. Bookings of your complimentary partner must be made and confirmed with us in advance of your chosen course. Your partner must be same for the course's duration (this doesn't mean you can't rotate with others during the class - we encourage rotation but it's not compulsory). Your partner must be of the opposite role to you (meaning if you are a follower, you need to bring a leader and vice versa). 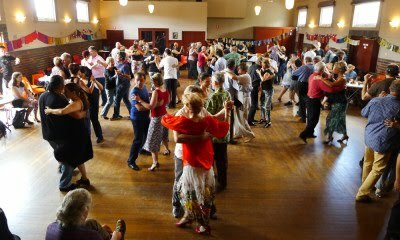 Learn to tango and join Sydney's vibrant tango scene where you can tango 7 nights a week!